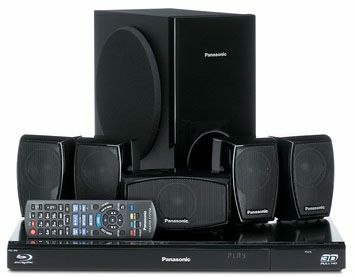 Panasonic SC-BTT270 review | What Hi-Fi? The only way you could stand out in the world of Blu-ray-in-a-box systems would be to not tick every spec box going. And that just goes to show how much you get for your money – almost every cinema system delivers almost every feature you could want. The SC-BTT270 is no exception. The price tag (and speakers) might be small, but the feature-count isn’t. It’s 3D-capable, has 2D-to-3D video conversion, integrated wireless and access to Panasonic’s new-look Viera Connect internet TV service. And there’s more: an iPhone/iPod dock, a USB input, DLNA media streaming, HD audio decoding, a digital optical input and an FM radio. No HDMI inputs, though. Viera Connect has the same basic but functional appearance as we’ve seen on the new TVs, but while YouTube, Twitter and Acetrax are present, iPlayer is still pending. The speakers are tiny. And the compact size is the positive side to the average build quality and design. A quick blast on the speaker test tone will let you check you’re wired correctly and set your speaker levels. The Green Zone Blu-ray proves they integrate well, passing sounds around smoothly and speedily, although they can get a little top heavy, not least when there’s lots to process. Sub integration is fine, but then again, it doesn’t have a lot of oompf. Music courtesy of the iPod/iPhone compatible dock sounds as you might expect: satisfactory for background fodder, but you wouldn’t want to be getting a party started. It’s a little bright and insubstantial. We’re happier with the picture. Dark scenes lack a bit of insight, but otherwise it’s detailed with DVD and gives impressive depth with Blu-ray – even more so 3D content with a compatible TV. You can get better sound even at this money, but it’s churlish to gripe too much.